Strong barber comb made of rosewood from Sibel. The Barburys Rosewood Comb No.2 is one of a new line of combs made of rosewood, which is characterized by its hardness and resistance to humidity. 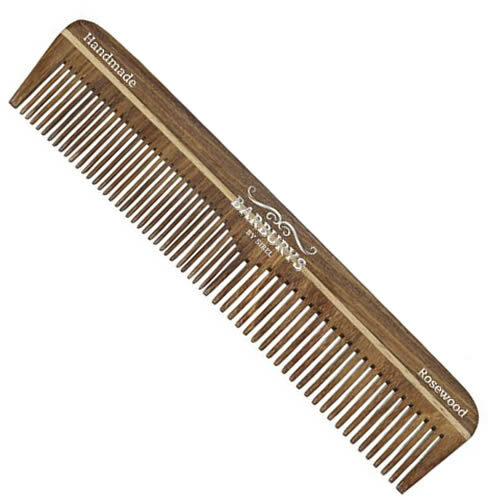 This handmade comb with anti-static effect would make an attractive addition to any barber shop or salon. No.2 is a 13-cm barber comb. £3.54 (inc. VAT) Why no VAT? We're a trade wholesaler and quote our prices without VAT to help our VAT-registered customers understand the true cost of a purchase. 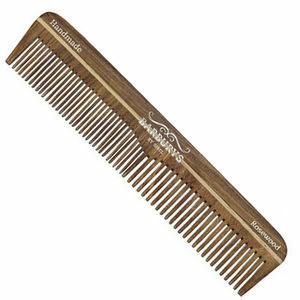 Strong detangling comb made of rosewood from Sibel, that is handmade and anti-static, as well as being tough and resistant to humidity. No.5 is a 176-mm detangling comb.